This is the easiest to make (and easiest to clean) recipe for face paint. Separate colors with a muffin tin or an egg carton. Place a spoonful of cold cream into each cup. Add 1 or 2 drops of different colors of food coloring to the cold cream, and stir. Apply the face paint using a clean paintbrush or cotton swabs. Your artwork will smell terrific with this simple watercolor recipe. Use a small cup for each color. Mix one package of powdered drink mix (Kool-Aid) with 2 tablespoons of warm water for each color. Stir until the powder dissolves. Once all of the colors are prepared, use a clean paintbrush to paint sweet-smelling pictures. Turn your windows, patio doors and mirrors into works of art. Mix together equal parts dishwashing liquid and washable liquid paint or powdered tempera. Children will love the process of painting and adults will love the end result: the paint wipes off easily with a dry paper towel. 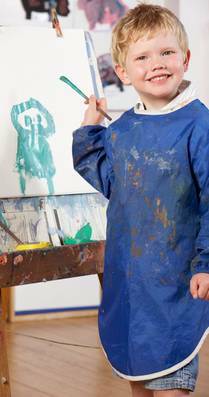 Encourage children to paint undersea adventure scenes while taking their evening baths. To make bath paints, simply mix together shaving cream with a drop of food coloring. Dip a paintbrush, or better yet, your fingers, into the mix and start creating! To level the playing field between painters of different ages and artistic abilities, place paintbrushes between your toes and paint with your feet!